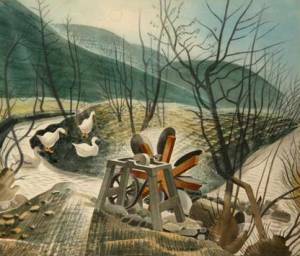 Eric Ravilious was a painter (mainly in water colours), printmaker and book illustrator who worked between the mid-1920s and his death when the aircraft in which he was flying as a war artist was lost off Iceland in 1942. 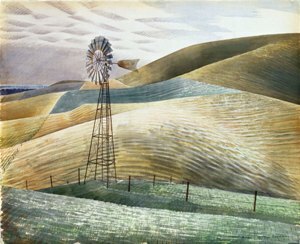 His work is marked by meticulous attention to detail, which he brought uniformly to all his many subjects, be they landscapes, interiors, war-related or, particularly in his early work, objects and scenes that just caught his eye: an abandoned caravan, derelict farm machinery, a broken-down bus. He could perceive – and convey – the beauty in such apparently unpromising subjects, and was meticulous in his treatment of them. The first room in this informatively curated exhibition, entitled ‘Relics and Curiosities’, is devoted mainly to work of this type. Other rooms centre on ‘Place and Season’, Figures and Form’, ‘Interiors’ and ‘Darkness and Light’. 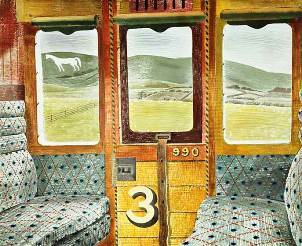 Some of his subjects – particularly some of the many he painted of the countryside – are of familiar images, for example, the Wilmington Long Man, the Cerne Abbas Giant and the Westbury White Horse (we see the horse twice, once apparently glimpsed through the window of a passing train, as it so often is). And you can almost feel the barbs on the wire fencing that frames the former two images. 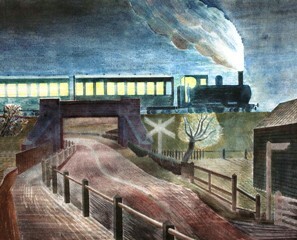 Some of the landscapes show Bawden’s influence and two interiors featuring bedsteads call van Gogh to mind, though they have an otherworldliness that is all their own. In two interiors of greenhouses, the rigid geometry of the framework is complimented by the linear arrangement of the flower pots. 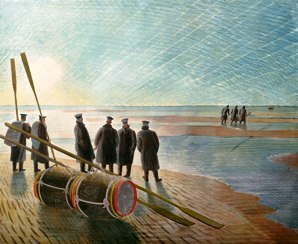 Perhaps most striking are the images deriving from Ravilious’s time as a war artist – the chilling ‘Dangerous Work at Low Tide’; a series recording life in submarines, and strangely unpopulated water colours of underground control rooms in which the detail is somehow enhanced by the low light. 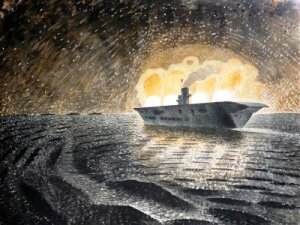 The contrast between light and dark is used to exceptional effect in many of his pictures, for example, ‘Ship’s Screw on a Railway Truck’, ‘Beach Head’ and ‘Ark Royal in Action’. The exhibition runs until the end of August. The gallery is within walking distance of both West and North Dulwich train stations. And put the dates of the next exhibition (devoted to Escher) in your diaries while you are there.